This work intends to characterize and simulate the meso- and submesoscale dynamics in Straits of the Philippine Archipelago, which may play an important role in the inter-basin exchange between the Pacific and Indian Oceans. The primary tool for the project is a nested grid implementation using the Regional Ocean Modeling System (ROMS) composed of basin-scale models that span the tropical Pacific and high-resolution model nests of the Philippine archipelago region. The inner nest resolutions will be chosen so that both geometric (complex coastlines and bathymetry) and dynamical features (such as submesoscale eddies) are resolved. The barotropic tidal forcing will be specified using the output from a global tidal model. A series of experiments will be performed using the ROMS tangent linear, adjoint and 4DVAR data assimilation system that will aim to explore the fundamental dynamics controlling the circulation and predictability of the region, with 4DVAR used to constrain the circulation via in situ and satellite data. The overall goal of this project is to understand the remote and local factors that control meso- and submesoscale processes in the Straits of the Philippine Archipelago region, aimed at enhancing our understanding of the oceanographic processes and features in and around straits. The long term goal of this project is to improve our capability to predict the inherent spatial and temporal variability of these regions using models and advanced data assimilation techniques, and thus contribute to the development of reliable prediction systems. 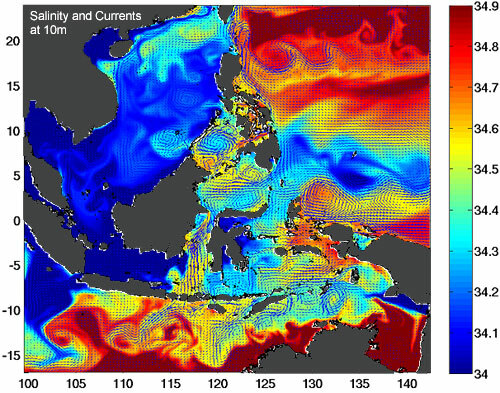 The importance of the proposed project is that the large scale control of the meso- and submesoscale variability in the Philippine straits by the equatorial waveguide, via interaction of the circulation with sudden changes in bathymetry and tidal forcing, may exert a significant influence on the predictability of the variability. Accomplishment of the proposed goals will not only advance our understanding of generation dynamics and predictability of meso- and submesoscale eddies near straits, but also directly contribute to the Navy's operational requirements.